Goals from Neil McManus and Mattie Donnelly helped Antrim beat DIT 2-22 to 1-09 in Thursday night's Walsh Shield decider at Casement Park. McManus accumulated a personal tally of 1-9 as the Saffrons romped to a 16-point victory on their own ground. Nine players were on target for Kevin Ryan's side as the Ulster county won the title for the first time. 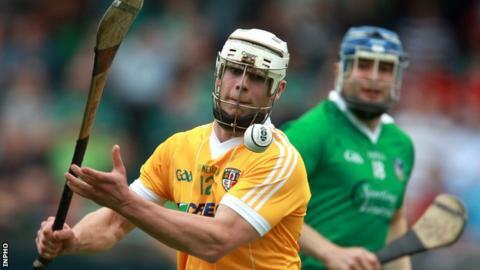 Antrim had edged out Laois by a single point, 0-18 to 0-17, at Rathdowney, in Sunday's semi-final to make the final. A late McManus point had proved the difference between the sides on that occasion. On Thursday night, the sides were level on three occasions inside the opening 14 minutes, before Antrim took a lead that they would never relinquish. McManus gave Antrim a comfortable seven-point interval lead, with an injury-time goal after Paul Shiels initial goal shot was blocked by DIT goalkeeper Finn McGarry. McGarry kept the Saffrons attack at bay for large periods of the opening half, pulling off three fine saves. 1-10 to 0-6 ahead at the break, the hosts continued their dominance on the restart with McNaughton adding his third point and Donnelly claiming a 37th minute goal. DIT responded strongly thanks to the efforts of substitute Mike Moloney who scored 1-2 without reply between the 43rd and 49th minutes to ensure a 2-12 to 1-9 score-line. McManus fired his third point and Antrim's first score in 12 minutes, as the hosts held a 2-13 to 1-9 lead entering the final quarter. Antrim tagged on eight unanswered points from the 51st minute until the end, with McManus accounting for five of these scores.